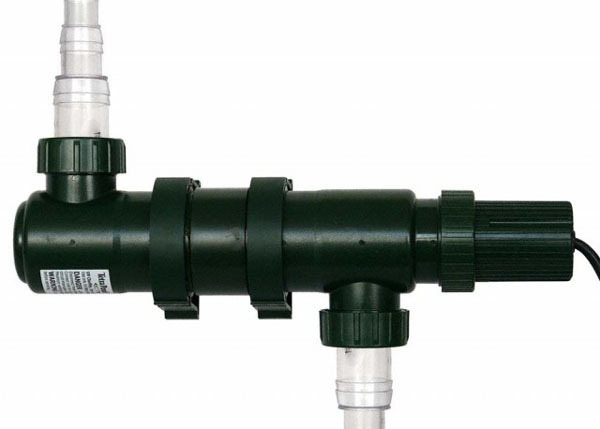 The Tetra ultraviolet clarifier works by exposing single celled algae to very high levels of ultraviolet light as the pond water containing them is pumped through the unit. The ultraviolet radiation not only kills the algae but causes it to clump together. These clumps can then be easily removed by your pond filter, water clarity is dependent upon the pond filter removing the dead algae. Provides permanent control of suspended algae which cause green water. Maintain beautiful water clarity while reducing pond maintenance. Compact, durable, easy to install and energy efficient. Includes UV Lamp, Quartz sleeve, adapter kit and power supply. Ready to install and use. A leader in Pond Supplies – A Leading Supplier of UV Clarifier for ponds!